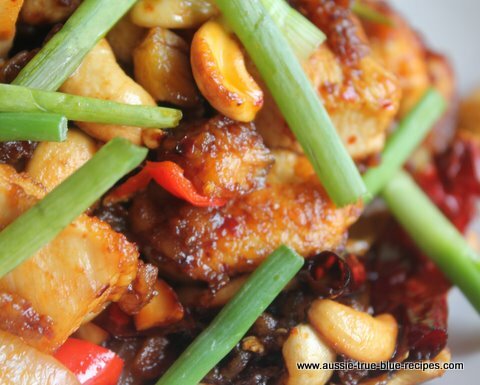 This recipe for Chicken With Crisp Chilli And Cashews will quickly move its way into one of your family favourites. A wonderful blend of spicy condiments, with just the right combination to win you over, this is the perfect Australian-style stir fry. Heat 2 tablespoons of the oil in a wok or frying pan. Add chillies and garlic and fry until crisp and golden. Add remaining 1 tablespoon of oil to pan and fry chicken and onion until chicken is golden brown and cooked. Stir in sauces, water and sugar and stir-fry for 2 minutes. Serve topped with fried chilli and garlic, and long-grain steamed rice.